Do you feel like your cardio program isn’t working for you? Or maybe you lost a bunch of weight with your program, and keep gaining it back? There are a few factors to consider when trying to figure out how to make your workout routine work for you. The first one to consider is your current eating habits. Are they falling in line with your fitness goals? Check to make sure your eating habits support and fuel your fitness goals, otherwise you will be setting yourself up for failure before you see any progress. If you are burning 500 calories in your run, but overeating 600 calories per day, you are going gain weight, not lose it. Your cardio workouts could also be failing you because the capacity of each workout may not be shocking enough to your body to increase your metabolic burn rate. Another common reason can be injury from a sudden onset of high impact exercise. The fonts and muscles weren’t prepared for the change in exercises, and they panic! If this is the case, it can also be a sign that injury is on the rise, and may stop us from exercising all together if we do not make some changes to our program. Here are two of our best practices in making our cardio days count! Thoroughly warm up the hips and shoulders before and after cardio. Using bands to tense these muscles do a great job of waking up many dormant muscle groups needed for a pain-free run. Alternate your workouts with resistance training. It is one of the best ways to keep your body shocked enough to maintain progress, and also prevent injury. Cardio burn stops as soon as your heart rate comes down, and your body goes back to normal for the rest of the day. Resistance training requires much more time after the workout is over to recover, which means that it will cost your body more calories for up to 2 days after the workout is over. This is the result of increasing your metabolic rate. How often should I exercise to maintain results? When determining your workout schedule, keep in mind that the average human should take part in moderate exercise at least 3 times a week for overall health. If you are doing resistance training, this should be sufficient enough to give you moderate result. Your body will continue to burn higher amounts of calories for up to 2 days post workout (increase in metabolic rate). This is really helpful in working towards weight loss, without having to be in the gym every day. Unfortunately, if cardio is your only source of exercise during the week, your calorie burn stops when your workout ends. Keeping a daily routine of calorie burn will be more vital to your progress. Be sure to add in a warm up routine (we recommend 5-10 minutes) and a cool down (we like slow and steady cardio 10- 20 minutes). 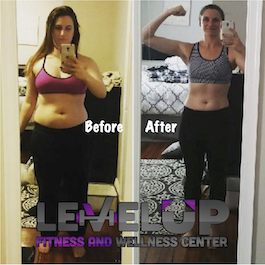 Level Up Fitness Waltham offer Small Group Training sessions, including high intensity H.I.I.T Classes. Click here to sign up for a Small Group H.I.I.T Session! OR Check Out our FREE Workshop Series December 8th 2018! Learn to build better workouts at home! Click here to register now! The Diet Roller Coaster. Are You On It? I have noticed that once clients have started a normal exercise regimen, food then becomes the determining factor of success and failure. Many people take up one of the “fad diet” offers that become so very popular this time of year. With the best intentions, they buy all the products, shakes, tupperware, pills, and most likely, start to lose weight. Then one day, the progress halts. Maybe it is because it became too much to keep up with, or maybe their body has just decided to stop responding, often leading to regaining weight. Either way, it is very unmotivating. So they find another rollercoaster to ride. To avoid the constant search for the new trend diet, you can make smaller changes to the things you already eat, for better results. No product purchase necessary. Here are some facts and tips about the rollercoaster ride to better health. The dieting syndrome affects approximately 70% of women, and about 40% of men. Fad diets often lead to unnatural rapid weight loss is mostly commonly due to the body burning more lean muscle tissue than fat for total weight loss. This means you could lose weight, but have more fat. 1. Delete the word “Diet” from your Dictionary. Diets usually equate to short bouts of unsustainable eating habits. In the end, they mostly screw with your metabolism and leave you struggling to lose weight. Instead, lets call it a “Nutrition Plan”. 2. Make your meals smaller, and more often. Giving your body too much food at a time overwhelms you digestive system. Instead of sorting through the good and the bad, your body stores it all away as adipose tissue or “fat”. Cutting your meal portions, and eating every 3-4 hours lets your digestive system act most efficiently, keeps your metabolism awake, and keeps your energy balanced throughout the day. 3. Watch your carbohydrate intake. This is where we most often get into trouble. Think of carbs (breads, starches, rice, sugars) as food choices that are necessary when doing strenuous activity only. If you are not burning high amounts of calories today, then you do not need a lot of high carb foods. Keeping your system properly hydrated can help with increasing your energy levels, curbs sugary food cravings, and decreases the amount of time you may be sore after a workout. As much as we all would love to drop 10 lbs of fat in a week, for 3 months straight, it is just unrealistic, and unhealthy. We like to use a safe number of 1-2 lbs of weight loss a week, or 1-2% of your total body weight. Set realistic goals, and be patient. At least when the results do come, they are more likely to stick. The Federal guidelines for Adults is 150 minutes of weekly exercise, including 2 days a week of strength training. Creating a regular exercise routine will help maintain blood sugar levels, and properly use any food that has been stored for energy. Exercise builds healthy muscle tissue that fight the creation, and build up of fat. Plus, if you stray from your nutrition plan for a short period of time, it will be much easier to burn off what you over-ate, and you can stay on track more easily. Whenever I am working with a new female client, in particular, I often hear them say “I just want to get toned”. Where the definition of toned is often the same between client and trainer, the path to getting there can to be filled with misconceptions and misleading for a new client. As a seasoned trainer, I am learning to spend much more time explaining the benefits and purpose of each type of training program. Hopefully this post will give you a better understanding of how to get the results you REALLY want! Muscle Definition is a necessity to being “Toned”. In fact, it is the definition. Yet, for some reason, I receive the most kick-back from clients when it comes time to pump iron. The fear is that they are lifting too much weight and will start to look bulky. Most clients looking to tone, do lots of cardio and endurance to get to the body they are looking for, and become frustrated when they lose more weight, but still don’t feel anymore toned. This downward spiral is because it is muscle we are missing. What does “Toned” look like? This disconnect between the want of being toned, and the work it takes to get there is where the problem lies. Some feel that the weights they are lifting make them feel like they are training to be a body builder. They are absolutely right! You want to build your body to look a certain way (toned), so you must build it. But not all body builders look alike. You can train for massive muscles, or just to lean out. First off, if you think lifting weights is going to make you look bulky, reinvestigate your food. Most people are currently eating to support weight gain. That is what will make you bulky, not the lifting. Hands down, your eating habits are going to have a direct effect on your progress. Plus, your nutrition is probably the #1 dictator of how much fat you store in your visceral (stomach) area. Storing fat in your stomach doesn’t feel or look good, and you are building layers of fat around your vital organs. Myfitnesspal.com is a FREE and easy website and phone app that can help you getting started balancing your food. Building muscle means that you will need to be lifting a challenging weight. By challenging, I mean something you can do 8-10 reps of, but probably not more. This type of exercise should optimally happen 3 times a week, for at least 6 weeks. If you want to see muscle definition, you firt have to have muscle to show the defintion of. This will not make you “bulky” (promise), but during this phase, you probably won’t see a dramatic weight loss either. Be patient! It is all a part of the plan. Once you have muscles to show, you will need to get rid of the layers of fat on top so you can see them. Now is the time to burn calories and shed the top ;ayers of fat. This is a great time to do low weight, high rep resistance training. This phase takes the muscles that you have spent the last 6 weeks building, and uses it to burn more fat, faster. The more muscle you have, the more fat you will burn over muscle tissue. Repeat this sequence of muscle gain and endurance phase until the desired result is achieved (and then after that to maintain it). Our team of trainers are always available to sit and meet with you to discuss what you can do to reach your fitness goals. Click here to schedule a Complimentary assessment to get more personalize information to reach your goals. The holidays season is approaching! That means, food, candy canes, briskets, stuffing, and lots of other goodies are next on the menu. I bet you are thinking of just forgetting all of your hard work, and starting fresh with a New Years Resolution, aren’t you? Not so fast. What if we found a way to have our cake and eat it too? (or apple pie? Insert favorite holiday food here). Since food is an important part of many holidays, celebrations, family and cultural traditions, Consider these 7 tips for fully enjoying the holiday season without gaining weight! Go for a walk, or mini workout with family before the festivities. Your body will get a head start at burning calories, and you’ll digest more efficiently. You read that right. Have a small plate of food now, then wait a hour, and have seconds, if your still hungry. Or pack yourself a plate to go. Most people will find that they are satisfied with the smaller portion when given enough time to digest it. Even if you eat more food, your body will appreciate the time to digest properly in between. Eating a light snack before going to holiday dinner parties will eliminate your desire to fill your plate. Some trail mix or fruit should be enough, and when you arrive to the event, you will be more likely to eat a smaller portion and still feel satisfied. Log the foods you want to eat in your food tracker before the feast. Decide which foods you really want to eat, and calculate how much you can have before you get there. I just use Myftinesspal.com for convenience from my phone. Ciders, Juices, sodas, and alcohol are all super high in calories. They can quickly take up your caloric FOOD intake, if you are not careful. Try light wines and beers, and non-alcoholic mixers (soda waters etc) for social drinking. I’m not saying you can’t drink the Egg Nog (I LOVE THE EGG NOG), I’m saying to just enjoy one, and find less filling drinks to socialize with. My social drink of choice is a flavored vodka and seltzer, and 2 limes. It’s less than 50 calories and tastes great! If you really want the food being served, have a small helping. Then double up on the vegetables and nutritious helpings to keep you full. You will get to taste everything, but only fill up on the good stuff. 7. Enjoy your holiday festivities! Overeating one day won’t make you gain weight! It will take days of overeating for that to happen. Have a day to enjoy yourself, and get back on track tomorrow.